Tag Archives for " Nametag "
My guest for this week’s episode of the Duct Tape Marketing podcast is Scott Ginsberg, author of 12 books, creator of the legendary nametag franchise. Readers of my book The Referral Engine met Scott and read about his incredible habit of wearing a name tag every single day of his life for over ten years and counting. Scott is one of my favorite writers, to meet him in person you’ll find a warm, frequently excited and always approachable human being that you’ll enjoy passing the time with. His vibrant personality comes through just as powerfully in his writing as well – even as he produces content at a clip that would make most writers pale. If you want a daily dose of passion, inspiration and some very useful and practical ideas, go subscribe to his Hello, my name is BLOG! 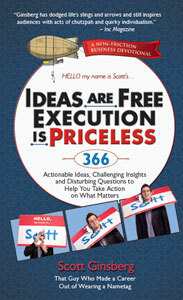 In this episode we talk about Scott’s latest book Ideas Are Free, Execution is Priceless:366 Actionable Ideas, Challenging Insights and Disturbing Questions to Help You Take Action on What Matters. Scott refers to this book as a business devotional and fittingly the book is designed with daily snack sized messages that are designed to inspire you to action. You can flip to today’s date, look up some advice for your birthday or just flip to any page and the book will work its magic. I read a lot of books and this style of daily snack sized reading is so easy to work into your daily routine. Listen to the entire podcast and you’ll get a feel for just how great each nugget in this book is.